Koronadal’s first "DOG-A-PALOOZA: A Valentine day celebration with our dog"
“Dog: the only creature on earth that loves you more than himself ” Not only human lovers deserves a treat this valentine season but of course our charming, adorable, and obedient dogs, with this, the city veterinary office of Koronadal held its first ever “Dog-A-Palooza: A Valentine day celebration with our dog” with the theme “Dog Palaging Mahalin” on February 11, 2012, the half day event started from eight o’clock until eleven o’clock in the morning that was participated by more than a hundred dog owners with their pooches at the Rizal Park. 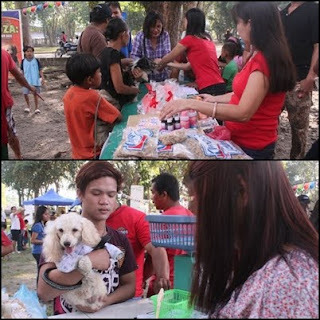 Each was given free stuffs, such, packs of dog food, soaps, shampoos, vitamins and dog accessories and special giveaways for the different winners on the fun games and activities for both the owners and their pets. Free consultation and medical services were also given during the said event from the City Veterinarian, Dr. Charlemagne S. Calo and his staff and other private veterinarians in the city. One way of treasuring our memories with our dogs is through photographs, that was also made available with their free picture taking in a photobooth plus a free photo printout. The most awaited part of the event was the slicing of the cake that was made of dog food and was evenly distributed to each dogs and ate it altogether. A Japanese Spitz puppy was raffled among those registered participants and was personally draw by Mayor Peter Miguel. 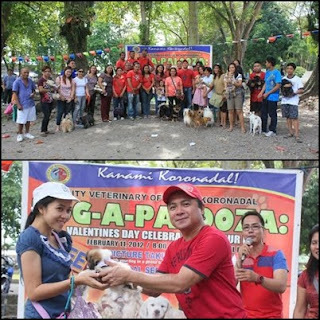 The event ended with a group picture taking with Mayor Peter Miguel, the City Veterinarian Dr. Charlemagne S. Calo and his staff, City’s private veterinarians, owners with their pooches and all those who participated to make the event successful.